Children of Fire started South Africa's first squatter camp library because education provides the long term solution to a vast number of the country's problems, including safety and health. In August 2001 it had more than 900 books and a large number of magazines as well. Most books were donated and second-hand. While there were a mish mash of titles - from Mills and Boon romances to rather Eurocentric children's nursery rhyme books, the library is much appreciated by residents of the Joe Slovo squatter camp. 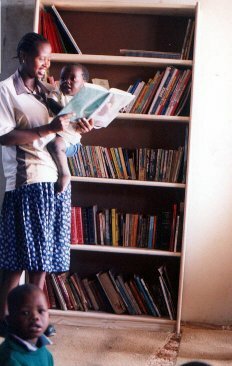 One Sunday in mid June 2001 we had 73 children and a few adults crammed into the creche-shack to enjoy reading. Some 20-30 year old Eagle annuals are thoroughly enjoyed by young boys in particular. 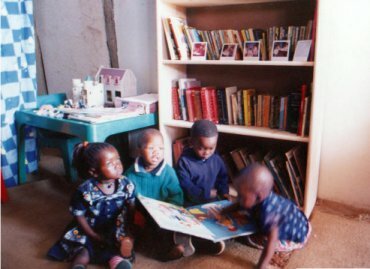 Following the fires at Joe Slovo squatter camp on 15 July 2001 and 28 July 2001, people who had to shelter in the creche until their shacks were rebuilt, also started to take an interest in the library. Books that are most needed are ones that explain how the human body works, Afrocentric storybooks, dictionaries and easy reading for adults. But absolutely anything helps. They can be posted to Children of Fire, P.O. Box 1048, Auckland Park 2006, Gauteng Province, RSA, but they must contain a customs' declaration to state the books are second-hand, for a charity, and have no commercial value as we have no budget to pay often inaccurately-applied excessive customs duty in South Africa. Some of the most pertinent titles for children currently in the library included The Flying Elephant, Nombu's Dream, The Plastic Throne and Hero of the Hills. They are all part of the Living Health Series which deals with topics like recycling waste, safe places to play, road safety, mobile clinics and building latrines. Despite worthy lessons, the stories are very readable and have good fact files at the back - though no South African addresses. We have five copies of each title, donated by publishers Macmillan, but consider the books so good that we'd really like 100 copies of each of the existing titles and any more that follow in years to come. 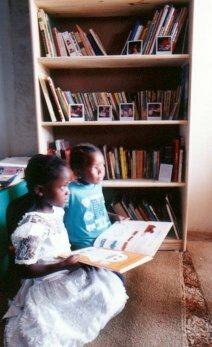 For little or large donations that have helped the library to date we thank Chris Partridge (UK), Nicholas Comfort (UK), Children of Wivenhoe (UK), Northcliffe Lions, Rosebank Rotary, Ithemba! Publishing, Mistry's Furniture, the Hellenic Youth of South Africa; Janet Abrahamovitch; Investec Cradle Group and Books Galore.